More kids classics examined, as we look at two films with a darker edge in the source material. But will the movie adaptations of Watership Down and The BFG sharpen or dull that edge? Join us and find out! Richard Adams’ 1972 novel of rabbit life, Watership Down, was adapted into this 1978 animated film, written, produced and directed by the American-born Brit Martin Rosen. It is the tale of Hazel (John Hurt), Fiver (Richard Briers) and a small group of other rabbits who leave their warren in search of a new, safer place to live after Fiver’s premonitions of coming doom. During their odyssey they must contend with the myriad dangers to a rabbit’s life, including foxes, cats, hawks, cars and, perhaps most surprisingly, rabbits. Narrowly escaping their warren after they are put under arrest for sedition and conspiracy to mutiny, they cross river and field in search of a new home, losing companions along the way but meeting some new ones, including Zero Mostel’s seagull Kehaar. Their biggest challenge arrives when they come into contact with the militaristic and restrictive warren run by the menacing General Woundwort (voiced by Harry Andrews). Hazel and his followers attempt to rescue some unhappy rabbits, an action which brings them into mortal combat with Woundwort and his lieutenants. True to the book, nature, red in tooth and claw, is the order of the day, and Watership Down wastes no time here as we see the bloodied (stylised) bodies of multiple rabbits within the first minute or so as the rabbits’ creation myth is recounted. The animation then transitions to a much more realistic depiction of rabbits, with a convincing portrayal of the lagomorphs’ lolloping gait, and pleasant watercolour backgrounds, often based on real locations in Hampshire, again like the book. Things aren’t a lot less bloody in this more realistic world; indeed they are a great deal bloodier as the film doesn’t shy away at all from depicting the injuries and deaths of its characters. I’m certain that some of this could be upsetting for the youngest viewers, despite its U certificate, and there is certainly a tone of menace and peril throughout, but the film doesn’t revel in this, nor use it to shock. Rather, it’s more of a “this is the way things are” approach, and it’s rather appealing. 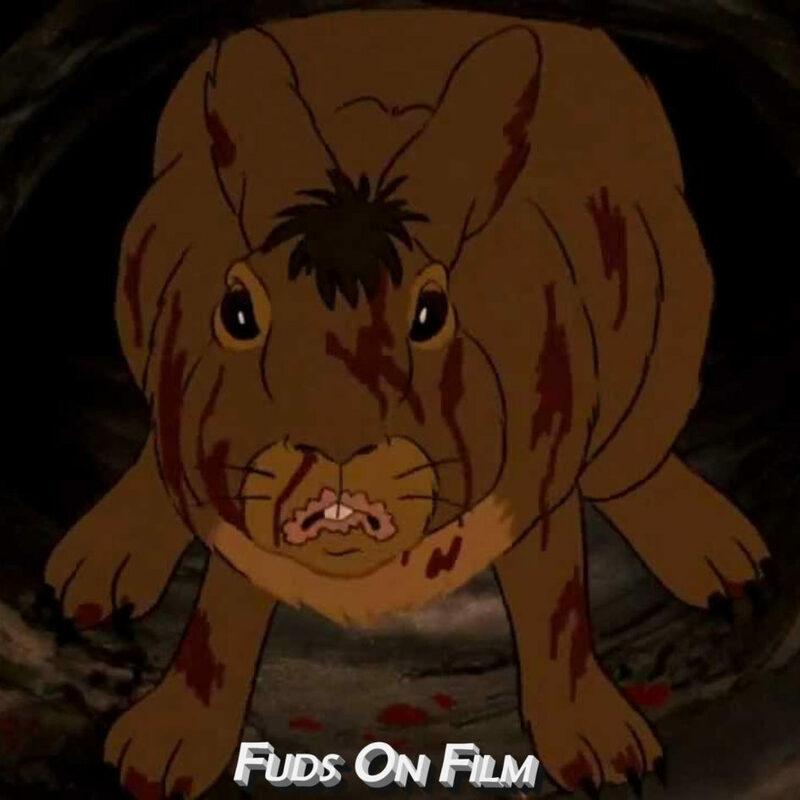 Unlike our other film for this episode, Watership Down has teeth (not an intended pun, but that too), and it’s all the better for it. Ruby Barnhill’s 10 year old orphan Sophie doesn’t seem all that happy living in the London orphanage that she finds herself in, but not to worry, she soon sees, and is subsequently snatched by a giant and taken far away. Hooray? The giant, who we shall soon know as Mark Rylance’s Big Friendly Giant, couldn’t have her blabbing about the existence of one giant, let alone the many giants that live in Giant Country. There we find rather less friendly giants, led by Fleshlumpeater, who we can assume eats lumps of flesh, Bonecruncher, who we can assume crunches bones, Childchewer, who we can assume chews children, and Meatdripper, who I don’t want to assume anything about. It’s just too disgusting. These clowns are all much bigger and stronger than the BFG, and bully him. The BFG hides Sophie, to save her from an eating, but all this palaver does not dissuade him from continuing the work Sophie observed him doing – harvesting dreams from a weird dream tree and inserting them into sleeping children. Creepy. Of course this all comes to a head when Fleshlumpeater and co get wind of Sophie presence and go ham on the BFG’s workshop, leading to a moment of existential despair that can only be solved by direct appeal to Queen Elizabeth the second god preserve her and her corgis god preserve them, who calls on the army to mop it all up in a much less violent way than would perhaps be imagined. A bit of a flop commercially, this. I’m sure going up against Finding Dory did it no favours in that department, but there’s something deeply English about this film that makes me wonder if it would ever have had international legs. The BFG himself is all a bit West Country mumblecore, and that isn’t really ameliorated when you realise that most of what he’s saying is a loose interpretation of English anyway. For a film whose, I imagine, prime audience just want to keep the kids quiet for a few hours, that may be a bit of a barrier. Outside of the West Country, at least. I guess I can’t really comment on what this is like as an adaptation – it’s been a long time since I’ve read this – but it does feel unusually low stakes for most of it. The giants, I seem to recall, are supposed to be terrifying. That’s why a friendly one is so unusual. Here they’re just berks. Big, dumb, lumbering berks that our ten year old hero could outwit. Hell, that a paper bag could outwit, so there’s no real sense, even fleeting of danger, to give this film any edge at all. Imagination it’s got in spades, and although there’s a few trips to the uncanny valley with the Rylance mocap/digital performance thing on the BFG, it mostly works, and I don’t think I can fault any of the production design at all. Looks great, great score, solid performances. It’s entertaining enough, I suppose, but it just doesn’t connect with much deeper than that. There’s perhaps that one scene where the BFG is regretting something in his past that gets a bit closer to uncovering some real emotion, and is about the only scene where you’d peg this as a Spielberg film, but this rest is a parade of stuff that happens and then is over without making all that much of a lasting impact. Maybe it’s just me, but this didn’t connect with any of the childlike wonder or imagination I’d hoped for given the pedigree behind the film. It’s a perfectly acceptable way to spend a couple of hours but doesn’t reach anything more than that. Which, to be fair, is enough, but this is isn’t another E.T.. It’s not even another Tintin, for that matter. Perhaps that unfairly holds Spielberg to a higher standard than other directors? Anyway, the end result is the same – The BFG is good, but not great.